In the first part of this two part series, we introduced control blocks: what they are, how to access them and how they can be useful. In this second article, we talk about z/OS control blocks: the basic control blocks and how to write programs to access them. In the previous article in this series, we introduced control blocks: what they are, why they're used, and how to look at them. In this article, we're going to look closer at z/OS control blocks. We'll look at some of the basic control blocks that every Systems Programmer needs to know, and coding examples to access these control blocks in Assembler, PL/1 and COBOL. If you're looking for control blocks in z/OS, the chances are that you'll start looking for them by referring to the two basic z/OS control blocks that point to almost everything: The PSA and CVT. The PSA is the first control block you need. It holds the basic information z/OS needs when scheduling work on a Central Processor (CP), which is why there's one for every CP. And the PSA is easy to find - it's always at address zero. FLCCVT - A pointer to the CVT (more on the CVT in a moment). PSAAOLD - A pointer to the Address Space Control Block (ASCB) of the address space currently scheduled on this CP. 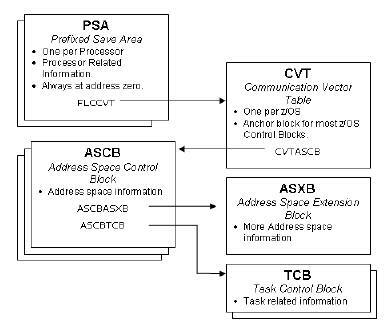 The ASCB holds basic information about an address space, including Jobname and Address Space ID. More information is held in the Address Space Extension Block (ASXB), which is pointed to by the ASCB. The CVT is a great control block. You can find pointers to a whole lot of other control blocks from here, including all ASCBs, SSVTs (Subsystem Vector Table - information on subsystems) and UCBs (Unit Control Blocks - information on hardware units like DASD and tape). Think of the CVT as an index to all the other z/OS control blocks. get the the SMFID from the SMCA. You can also see that we include z/OS macros to include DSECTS that map these control blocks at the bottom. But you don't have to program in Assembler to access control blocks. Suppose we want to get the Jobname and Address Space where we're running. Check out the following PL/1, C, COBOL and REXX examples. SET ADDRESS OF PSA TO NULL. SET ADDRESS OF ASCB TO PSAAOLD. SET ADDRESS OF JOBNAME TO ASCBJBNI. SET ADDRESS OF STCNAME TO ASCBJBNS. DISPLAY "(DZSCOB1) " STCNAME ", " JOBNAME. All of these programs use the PSAAOLD field in the PSA to get the address of the current ASCB, then get both the Jobname (which will only exist if the code is running in a batch job or something similar that runs in an initiator) and the started task name. The problem with using high level languages is that IBM doesn't supply a way of mapping the control blocks in these languages - only Assembler. So you need to map them yourself, and we've done this in the above examples. However if you're using the IBM C compiler, there is a batch utility that converts Assembler macros to C defines. Many z/OS control blocks are chained off two basic blocks: the PSA and CVT. You can quite easily access these control blocks not only from Assembler programs, but from High Level languages like C, PL/1 and COBOL.